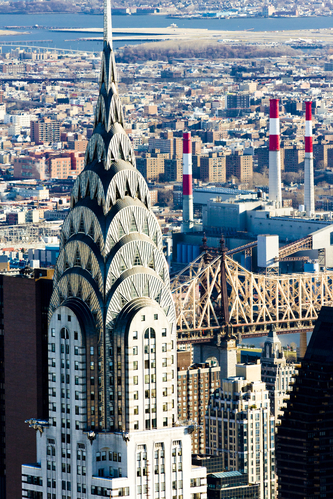 The Chrysler Building, a 77-story art deco masterpiece wearing a sunburst crown of steel, was the first structure exceeding 100ft ever built by human hands. At sunset, it turns into a beacon of art open to all, as beams of fading light reflect and explode through the triangular windows at the building’s peak. This wonderful tower is a sight to behold; and is almost certainly the most remarkable attraction in New York that you can see up close for free. Most of the Chrysler building is leased to businesses, who offer their customers some of the greatest views of New York you could ever hope to see. There’s even a dentist’s surgery on the 69th floor, offering the only opportunity you’ll ever have as a member of the public to admire the view through those triangular windows. That might just take the edge off getting work done. Regrettably, the public observation deck has been closed since 1945; the result of all the tourist traffic of the time being more impressed with the taller Empire State Building, which took the ‘largest building’ title away from Chrysler and some of the allure along with it. There’s still plenty to admire though; the visitor lobby boasts walls of Moroccan marble, and a ceiling mural by Edward Trumbull depicting the history of Chrysler as innovators of transport. As a niche point of interest, the digital clock in the reception area was the worst in world history and is still functional.